Apple's major iPhone assembler, Foxconn, is looking to produce the phones in India to lessen the company's dependence on China. This corroborates reports in India's The Economic Times which claimed in December 2018 that Foxconn was about to invest approximately $214 million in a local plant. "Senior [Foxconn] executives, possibly including Chairman Terry Gou, plan to visit India after next months' Lunar New Year to discuss plans," writes the Wall Street Journal, quoting sources familiar with the plans. The report says that Foxconn's plan is to produce higher-end iPhones in India. Currently Apple partner Wistron makes the lower-end iPhone SE and iPhone 6s in India. Details on the Taiwan Stock Exchange this month confirmed that Wistron is investing $340 million in expansion, though this is unlikely to be all for iPhones as the company assembles for other firms. Foxconn also assembles devices for different companies, and some of that work uses existing plants in India. If plans to expand into iPhone production are correct, then the move would ease Foxconn's reliance on China —and potentially also reduce the impact of any US-China trade war on Apple. For similar reasons, Foxconn has also been reportedly considering moving production to Vietnam. 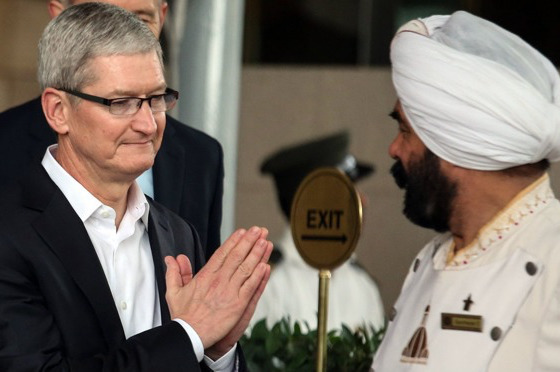 Unlike Vietnam, however, a move to India would also help another issue facing Apple. India imposes stiff taxes on imports, to encourage manufacturers selling phones in that country to also make them there. Apple has already looked to producing refurb iPhones to fulfil this obligation. According to the Wall Street Journal, though, for India to produce higher-end iPhones it "will have to do more to develop its smartphone supply chain to compete with China, where Beijing and local governments have worked to move factories up the value chain."